In Canberra, a politician who is undertaking a difficult reversal manoeuvre is said to be attempting a double backflip with pike. 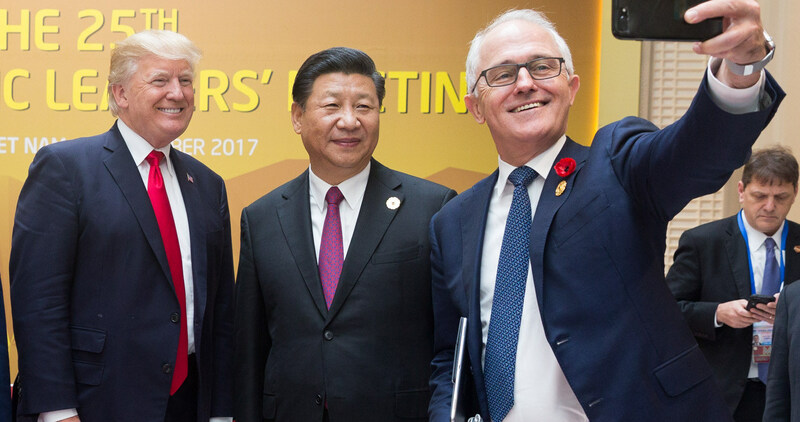 The 2017 foreign policy white paper is the Australian government's attempt to pull off an even harder gymnastic move: hedging against the dual risks of a reckless China and a feckless United States. At different times Australians have worried about one or other of these challenges. Now we need to concern ourselves with both at the same time. Under President Xi Jinping, China is converting its dizzying economic gains at home into influence abroad. China aspires to be the pre-eminent power in Asia. It wants a regional order focused on China, rather than the United States. Beijing's tactics are bipolar, however. Sometimes China's diplomacy is skilful. Increasingly, however, its rising confidence is expressed in ways that alarm its neighbours, including its unrelenting approach to territorial issues and its conduct of influence operations in other countries, including Australia. We do not know how China's external policies will develop as its power grows and authority is concentrated in the person of Xi. So far, the trajectory raises concerns. The United States is the only country capable of running a global foreign policy and projecting power anywhere on earth. For three-quarters of a century the US forward presence in Asia has underpinned regional stability. Yet the president of the United States, supposedly the leader of the free world, doesn't believe in the free world and doesn't want to lead it. Donald Trump's instincts run counter to the traditional US approach to Asia. He is allergic to alliances, hostile to free trade and enamoured of strongmen. This is unnerving for Australia, which is a US ally, a trading nation and an old democracy. Canberra will hope, therefore, that its new white paper is read in both the Zhongnanhai leadership compound in Beijing and the White House in Washington. The document argues that it is in the interests of both China and the United States to play by the rules. It also promises that the Australian government will step in to reinforce the international order. After all, as the paper notes, "Australia will be safer and more prosperous in a global order based on agreed rules rather than one based on the exercise of power alone." This assessment is correct. If we are a beneficiary of the global order, then occasionally we must serve in its bodyguard. We should encourage the Trump administration to maintain a leadership role in Asia. We should bolster international institutions towards which Mr Trump is ill-disposed. And we must strengthen our connections in Asia, including by thickening our ties with Asian democracies such as India, Indonesia, Japan, and South Korea. We must not fall into the intellectual trap of shrinking Asia to the dimensions of China. Few Asian countries want to live in another's shadow. We all have the right to make our own way. This does not mean we should be negative about our relationship with China. When our interests overlap with China's, we should be ambitious about the terms of our cooperation. Sometimes we should say yes to China when Washington says no. But when our interests and China's interests diverge – and in particular on difficult strategic issues – then our paths will also need to diverge. This week the Chinese state-owned newspaper Global Times complained that while Australia "is economically dependent on China, it shows little gratitude". But relations between sovereign states are not based on gratitude, they are based on interests. The white paper is clear-eyed in its analysis and clean in its drafting. But the paper is less important, of course, than the policy. What will be the character of Australia's foreign policy in future? In recent years Australia has responded to events – from the downing of MH-17 to humanitarian crises in our own region – with great professionalism. It is harder to identify instances where we have guided events. At certain moments in history Australian governments of both colours have shaped our external circumstances – through the negotiation of the ANZUS treaty with the United States and the commerce agreement with Japan, the recognition of the People's Republic of China, the development of APEC, and the intervention that helped East Timor win its independence. But what are the shaping initiatives in which Australia is currently engaged? Where is the policy ambition that the bracing analysis in the white paper demands? This deficit is surely not unrelated to the condition of Australian politics. After all, a country's influence overseas is underpinned by the quality of its society and its economy. Foreign policy begins at home. For a decade, governments in Canberra have struggled, churning through leaders and clinging to office from poll to poll. If our politics remain small, it is hard to imagine our foreign policy getting larger. As the United States does less under President Trump, countries like Australia should do more. As China asks questions of the international order, we should help to answer them.